Don’t judge this pasta by the above photo. This pasta tastes much better than it looks. Trust me! I have made it 3 times so far, and it’s been a hit each time. Eli’s words the other night, “mmmmm, this is just so good.” That’s all I needed to hear. This pasta is one of those super easy, weeknight throw together pastas. I prepared it and had it on the table in under 30 minutes. It’s also a one-bowl meal, which makes it even better. 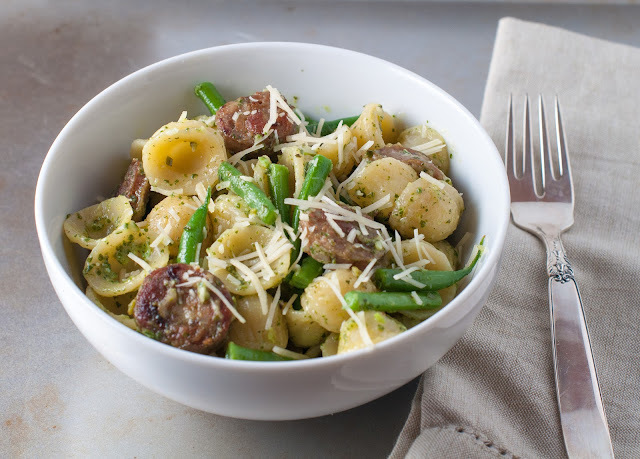 Another thing I love about this pasta is that the green beans cook with the pasta. You just throw them in for the last 3 minutes with the pasta and drain them both together. LOVE IT! If green beans aren’t in season, I use broccolini or broccoli rabe in place of the green beans. I just cook the broccoli rabe for the last minute of the pasta’s cooking time! I also love using rigatoni pasta! I went easy on myself and bought the pesto. Yes, even Marin mama cuts corners on dinner. Paradise Foods has the best pesto, and sometimes (a lot of the time) I don’t feel like making my own, so I just buy theirs. I do have some great pesto recipes that would work well with this pasta. If you’re up for making your own, you could try my basil pesto and even my walnut pesto. Both of them would be great additions, but I’m assuming that most of you will go the store bought route for your pesto, so go for it! We can’t be Martha all the time, right? Sometimes you have to weigh the pros and cons. Do I want to make some brownies or pesto, hmmm, difficult choice there, mmmm, not really. large bunch of green beans, trimmed and cut into 1-inch pieces – I never measure out my vegetables. I go vegetable heavy, as we could all use more veggies in our diet. Just grab yourself a big handful or two, and call it a day. I use baby broccoli or broccoli rabe if green beans are not in season. 1/3 to 1/2 cup pesto – I used 1/2 cup as we love pesto. 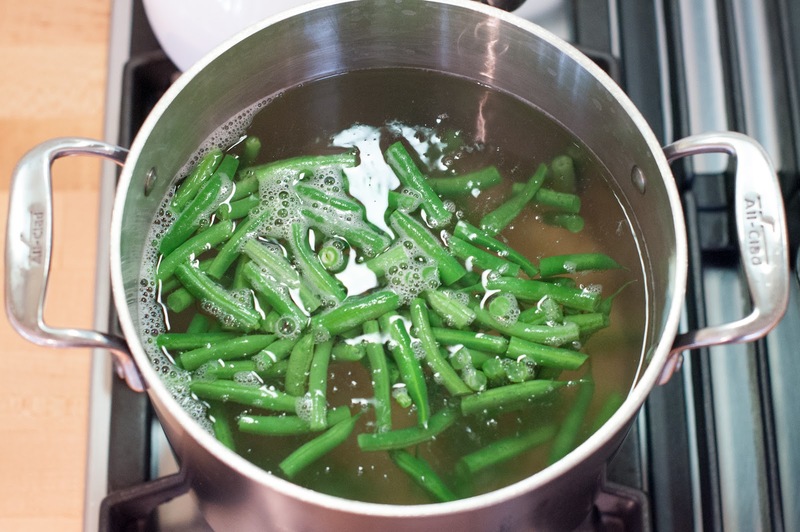 Wash and trim your green beans into 1-inch pieces. Bring a large pot of salted water to a boil for the pasta. 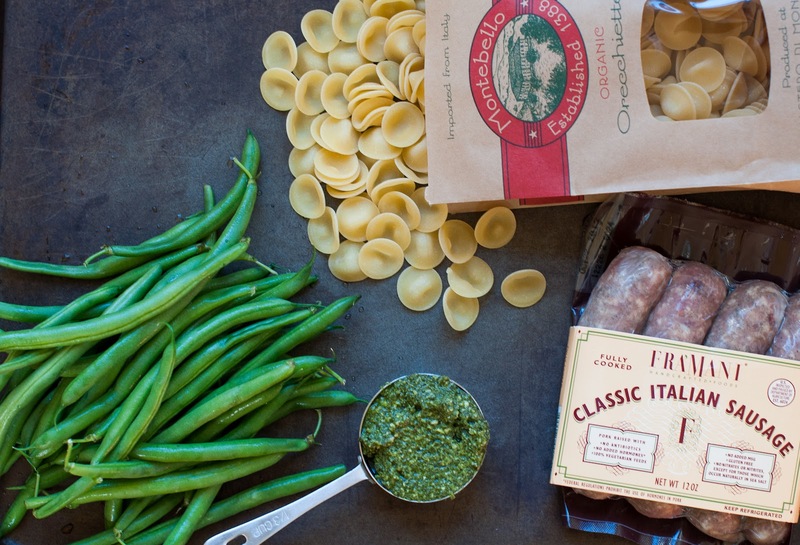 While the pasta water is cooking, cook up your sausages. You can either grill them or sauté them in a pan. The grill master was not home, so I cooked mine in the skillet. Heat about 1/2 tablespoon of oil in a skillet over medium heat, (if your pan seems dry, add more oil) add the sausages and cook, turning occasionally, until evenly browned, 8-10 minutes. Let the sausages cool a bit and then slice them into thin slices. Cook the pasta according to the package directions, adding the green beans during the last 3 minutes of cooking time. If you’re using broccolini or broccoli rabe then add them in for the last minute of cooking time. I loved this step because it was all done in one pot at the same time! How efficient! Reserve a cup of the pasta water. I put this part in, but I tend not to use to much pasta water as it makes my sauce to watery. I also don’t shake my pasta out when I drain it. I drain it and then immediately return it to the pot, so there is always some extra water there anyway. Drain the pasta and green beans together and return them to the pot. 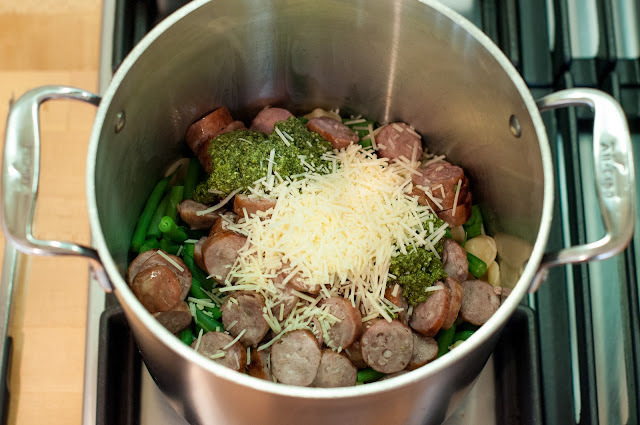 Add the sausage, pesto, parmesan and some of the reserved cooking water to the pasta, and toss to combine. Add more cooking water if the pasta seems dry. Serve the pasta up into individual bowls and top them with some fresh parmesan. I make sure that each bowl gets a good amount of green beans. This is a pantry pasta, so you could really just throw in just about any vegetable. Frozen green peas, broccolini, broccoli, asparagus and spinach are some good choices. 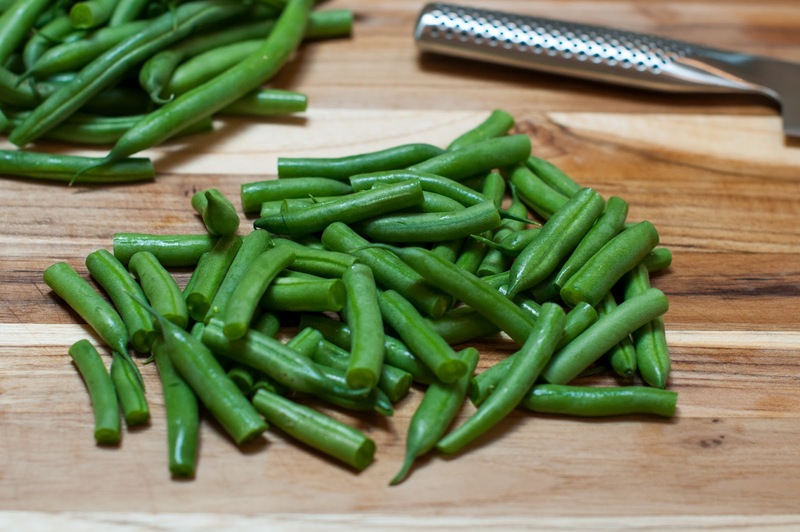 large bunch of green beans, trimmed and cut into 1-inch pieces - I never measure out my vegetables. I go vegetable heavy, as we could all use more veggies in our diet. Just grab yourself a big handful or two, and call it a day. I use baby broccoli or broccoli rabe if green beans are not in season. 4 Italian, turkey or chicken sausage links or ¾ pound of ground sausage - I used classic Italian style sausages. ⅓ to ½ cup pesto - I used ½ cup as we love pesto. 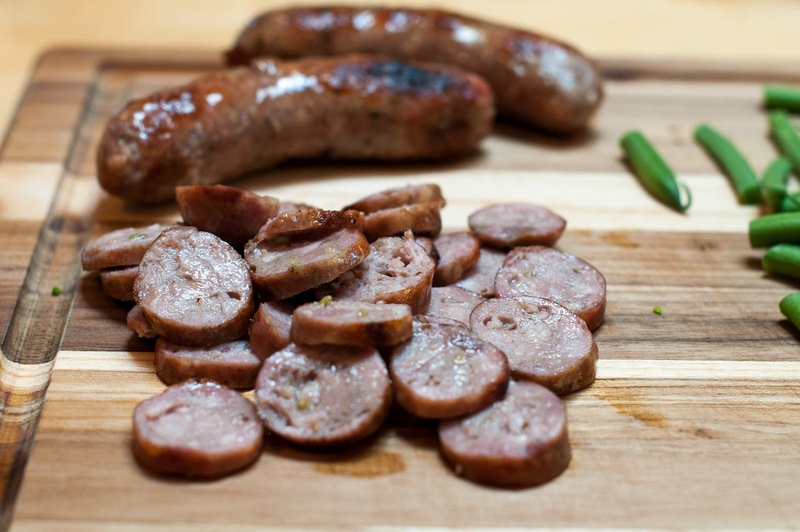 While the pasta water is cooking, cook up your sausages. You can either grill them or sauté them in a pan. The grill master was not home, so I cooked mine in the skillet. 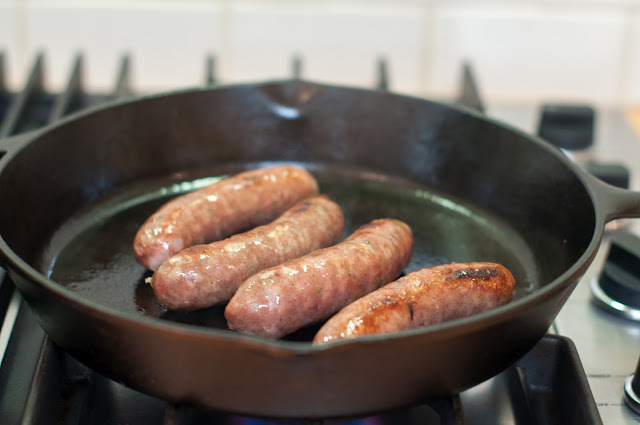 Heat about ½ tablespoon of oil in a skillet over medium heat, (if your pan seems dry, add more oil) add the sausages and cook, turning occasionally, until evenly browned, 8-10 minutes. Let the sausages cool a bit and then slice them into thin slices. Cook the pasta according to the package directions, adding the green beans during the last 3 minutes of cooking time. If you're using broccolini or broccoli rabe then add them in for the last minute of cooking time. I loved this step because it was all done in one pot at the same time! How efficient! Reserve a cup of the pasta water. I put this part in, but I tend not to use to much pasta water as it makes my sauce to watery. I also don't shake my pasta out when I drain it. I drain it and then immediately return it to the pot, so there is always some extra water there anyway. 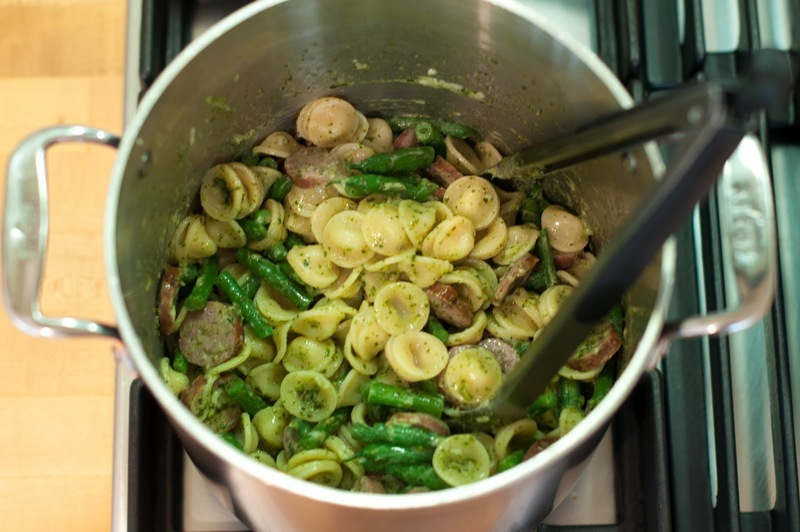 Drain the pasta and green beans together and return them to the pot. Add the sausage, pesto, parmesan and some of the reserved cooking water to the pasta, and toss to combine. Add more cooking water if the pasta seems dry. Serve the pasta up into individual bowls and top them with some fresh parmesan. This was delicious tonight! Thank you Jackie!!! Made this tonight and it was excellent! I paired it with your kale salad. My husband and I love everything we’ve tried from your site. Excellent! Made this last night and my family loved it! My kids are hard to please but this was eaten with gusto. Thanks!! Just showed this to the girls and they are on board. Will try it this week and let you know the results!!!! Made this last night and it was a huge crowd pleaser. My kids had it with just butter, perto is much to exotic for them, I had it sans pasta since I am low carb. My hubby and his friend had two servings each! So nice to have a dish so easy that makes everyone happy. My kids love pesto and I love easy dinners, so I’m definitely going to make this pasta. I saw you the other day at Whole Foods picking up some kale:) I wanted to say hi, but I was to shy. Anyway, I love your blog. Hi Wendy! Thanks for stopping by and commenting. I wish you had said hi to me! I love it when people come up to me and tell me they know about my blog or that they have made a recipe. It totally makes my day (week) when I run into someone who reads my blog that I don’t know. I love knowing that there are other people besides my family and friends (love you guys) who are reading the blog and actually making some recipes. SO, please say hi next time! I love anything with pesto so I might as well try this recipe! I’m not a huge fan of green peas so I might try it with broccoli or asparagus! Have a lovely day Marin! Hi Maria. 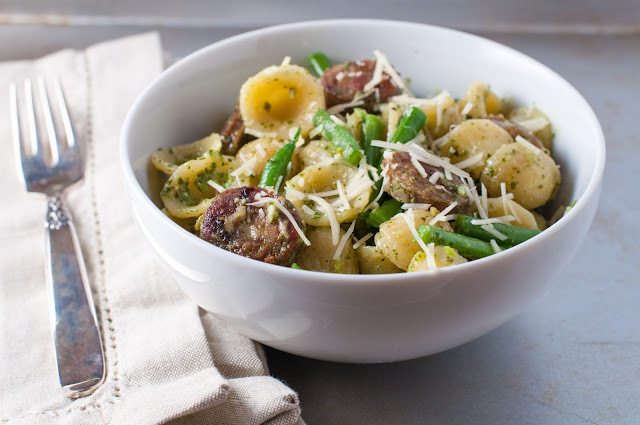 Broccoli or asparagus would taste amazing with this pasta. It really works with just about any veggie. Delicious flavors in this pasta, Jackie. I can’t bring myself to buy commercial pesto though, so I’d better make it quick before basil season is over. Hi Sharyn! The flavors do work well together. The pesto I buy is actually made fresh at the store. They make a fresh batch a couple of times a week, so I don’t feel as guilty buying it from a store. Maybe you should send me over your favorite basil recipe. I’m sure you have a wonderful one and I would love to try it.